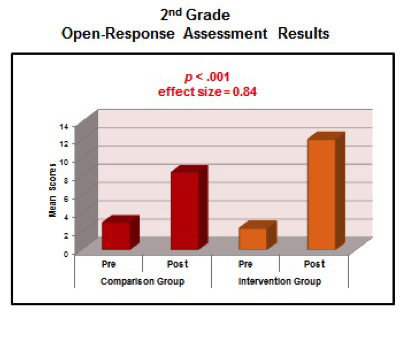 Research has demonstrated that the Project M² field test groups in kindergarten, first and second grades showed significant gains from pre to post testing across all schools on open-response assessment that measured growth in geometry and measurement. 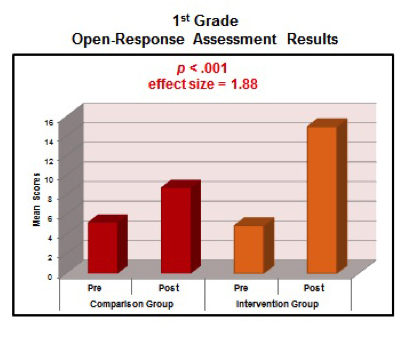 There were also significant differences favoring the field-test group over a comparison group of students of like-ability in the same schools on the open-response assessment. At each grade level the effect size was large, indicating the field-test students were from almost one-year to almost three-years ahead of the comparison group in terms of grade-level equivalence. 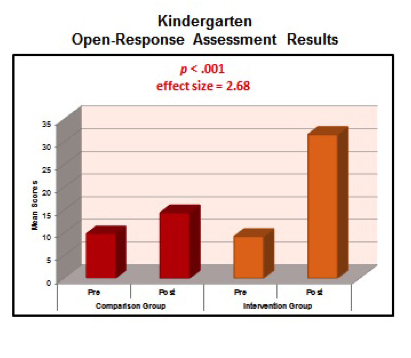 Pre- and post-testing of the open-response questions showed significant gains across all schools for the intervention groups in Kindergarten, Grade 1 and Grade 2.